Homophones are words that sound alike but have different spellings and different meanings, like peace and piece or their, they’re and there. 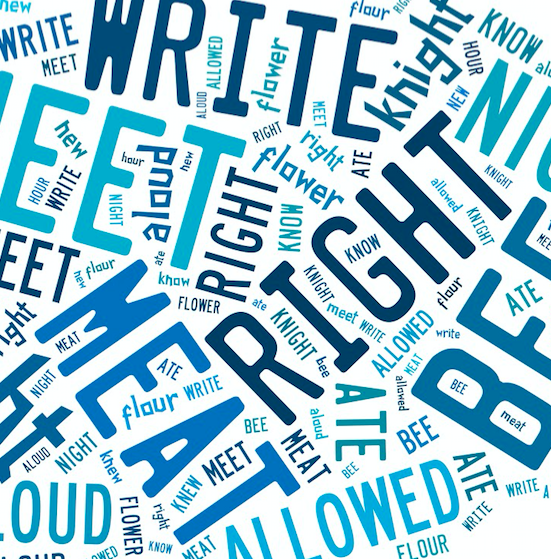 And they constitute some of the most common spelling errors in student writing. Unfortunately, even spellcheckers can’t help. But mnemonics can. The problem isn’t knowing how to spell the words. Most of them are pretty easy to spell. The problem for our students is knowing which word to spell. So all the students need to do is find a memory trick for one of the words – and the other usually falls into place. For example, a student wants to write a sentence like: The governments signed a ____ treaty. Is the right word piece or peace? Well, here’s a memory trick to remember the word piece. Notice that the word piece contains the word “pie.” Think of a piece of pie. Is the word needed in the sentence above the kind of “piece” as in a piece of pie? No, of course, not. It’s the other peace – by default. By creating mnemonics, or memory tricks, to remember one of each tricky homophone pair, writers can use the process of elimination to decide which one to spell. Here are some examples. But they work even better when the students come up with their own mnemonics. stair/stare: Climb a stair into the air. thrown/throne: One person can sit on a throne. witch/which: The witch had an itch. hear/here: You hear with your ear. pause/paws: You (U) take a pause (and U don’t have paws!). hole/whole: The w fell down the hole. male/mail: The male’s middle name was Al. who’s/whose: Whose hose can I use to water the lawn?